In 2017, capSpire ranks #2,082 on the prestigious Inc. 5000 List by Inc. magazine. This is the fifth consecutive year that capSpire has been recognized among the fastest-growing private companies in the U.S., thanks in part to its incredible 177% growth over the last three years. Inc. magazine created the Inc. 5000 List to celebrate independent entrepreneurs and the robust strategy, service, and innovation that results from their hard work. Described as “the superheroes of the U.S. economy,” the 5,000 companies on the list represent diverse industries. Each summer, Inc. magazine announces rankings based on factors that include revenue and job growth. “As a fifth-time honoree, capSpire is part of a very select group of companies. Inc. magazine calls it ‘the honor roll’ because fewer than one-tenth of Inc. 5000 honorees achieve this milestone. We are so excited to be included in such an exclusive group and are grateful to Inc. magazine for continuously extending this honor to our company year after year,” says Lance Laubach, capSpire CEO. Since our inception as a start-up in 2009, capSpire has become a global technology consulting and solutions company with six offices throughout the U.S. and Europe. A contributor to capSpire’s growth is the continual expansion of inventive technical solutions that simplify clients’ business operations. In 2016, we launched the capSpire Optimization Platform. This platform aggregates data from multiple systems to help clients in the energy industry optimize inventory levels, plan for an array of supply-and-demand scenarios, manage supply-chain variabilities, and increase margins by improving strategic and tactical decision making. capSpire’s consulting practice has grown tremendously as well. Key areas of growth in our consulting practice include analytics and advisory offerings, such as reviewing business processes and assisting in the selection of energy-trading-and-risk-management (ETRM) systems. In 2016 alone, capSpire provided consulting services to 66 companies in eight countries. Having become the go-to resource for implementing and enhancing trading and risk systems, capSpire is a trusted advisor throughout the energy industry because of our track record of completing projects successfully, on time, and on budget. Another important factor in capSpire’s growth is our ability to hire and retain the brightest minds and problem solvers in the industry. We pride ourselves on encouraging a collaborative, team-based atmosphere and fostering a unique culture that gives employees a high degree of autonomy and flexibility, as well as abundant opportunities for training and advancement. As a result, capSpire has received the When Work Works Award by the Families and Work Institute and the Society for Human Resource Management for the past five consecutive years. 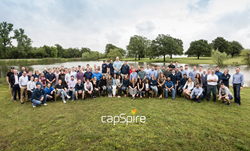 Simply put, capSpire is a sought-after workplace among recruits, and employees are excited about coming to work each day and reaching beyond the status quo to find a better way for clients. capSpire provides the unique combination of industry knowledge and business expertise required to deliver impactful business solutions. Trusted by some of the world’s leading companies, capSpire’s team of industry experts and senior advisors empowers its clients with the business strategies and solutions required to effectively streamline business processes and attain maximum value from their supporting IT infrastructure.